An adaptation of the hit stage musical, Annie is bloated and off-target. The setting is New York City during the Great Depression. Annie (Aileen Quinn) is a mischievous 10 year old orphan whose dreams of reuniting with her parents help her survive squalid conditions in the orphanage run by the obnoxious Miss Hannigan (Carol Burnett). Daddy Warbucks (Albert Finney) is a Republican billionaire in search of good publicity, and his secretary Grace Farrell (Anne Reinking) selects Annie as the lucky orphan to spend a week at Warbucks' massive mansion. 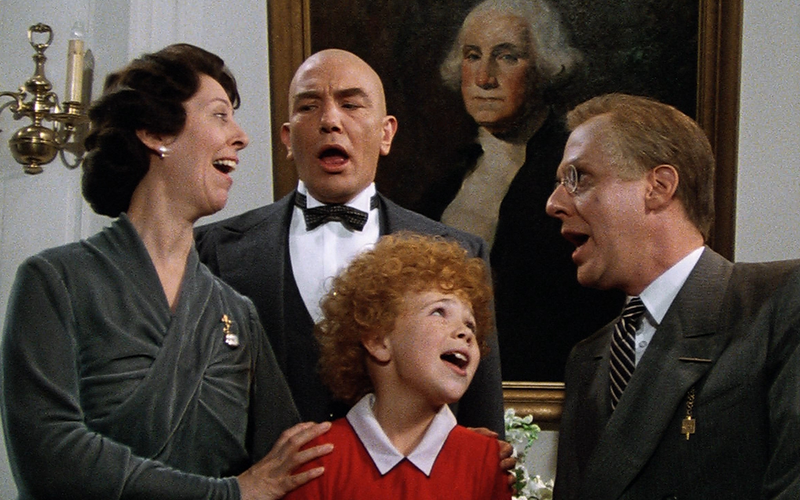 Annie brightens up the house, enchants the servants and melts Warbucks' heart. He offers a reward for her real parents to come forward, sparking a frenzy as desperate scammers make false claims. But Miss Hannigan's con-artist brother Rooster (Tim Curry) and his girlfriend Lily (Bernadette Peters) devise an elaborate ruse to falsely claim Annie as their daughter and make off with the money. Somehow, producer Ray Stark tapped 76 year old veteran John Huston to direct Annie. Working from a Carol Sobieski script, this was Huston's first and ultimately only musical. Totally bamboozled by the child-oriented material and the genre, Huston delivers a bumbling and plodding adaptation. The production values are decent, but otherwise the song and dance numbers are listless, the dialogue scenes stiff, and the performances grating. A joyous, upbeat and inspiring stage show is turned into a laborious chore clocking in at an interminable 128 minutes. Some of the decisions by Huston and Sobieski are simply baffling. A large chunk of Greta Garbo's Camille, a film about courtesans, is inserted into Annie, but only after a glitzy show by the dancing girls of Radio City Music Hall. And not one but two bodyguards are created for Warbucks to help set up a garish chase ending complete with a helicopter rescue. Meanwhile, the song Tomorrow, which is the highlight of the entire show, is given away entirely during the opening credits and then half-baked into an inert scene with President Roosevelt (Edward Herrmann). Aileen Quinn gives her all but gets no help from Huston, while Burnett, Curry and Peters overact as though there is no difference between stage and screen. Worse of all is Albert Finney, a British actor plonked into the role of the prototypical American tycoon, and understandably bemused into irrelevance. Shouty and tone deaf, Annie hits all the wrong notes.